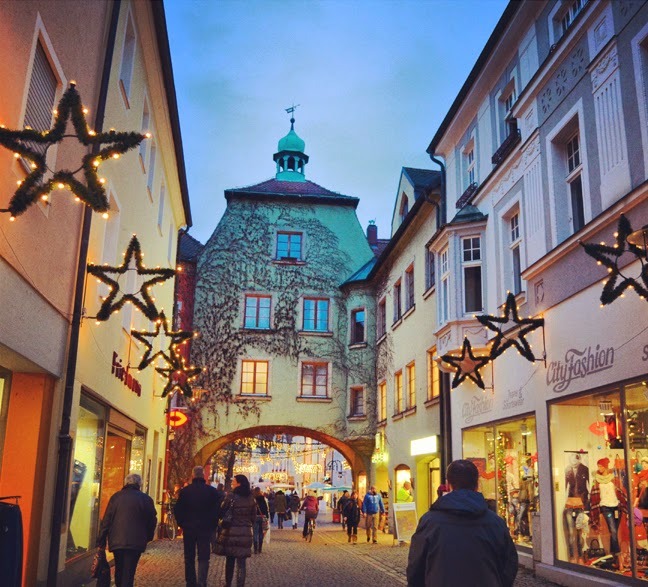 One of the things we've been looking forward to most about this winter is going to all the Christmas markets Germany is famous for! 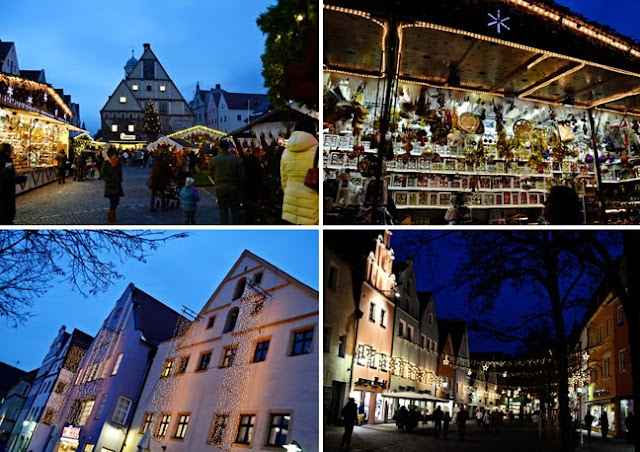 Chris has been "on call" the last week so we couldn't venture further than a half hour away so we decided to go to the Weiden Christmas market on Saturday night. 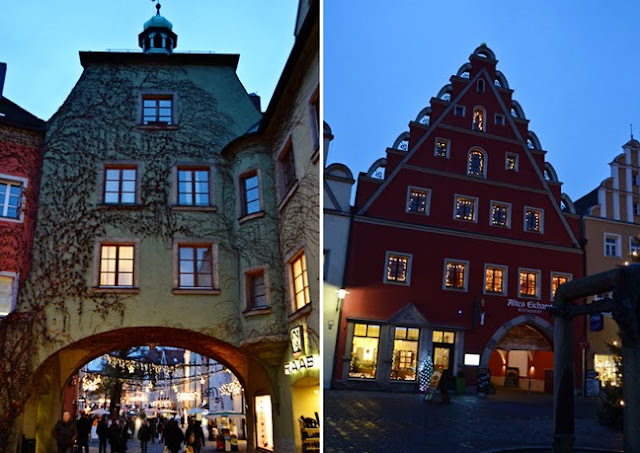 Weiden will always have a special place in our hearts because it's the very first town we visited when we moved here. We love it so. We parked in an underground garage and made our way up to the "mall" - which was totally decked out - hooray! Let Christmas begin! It gets dark by 4:10pm so the lights were already on when we arrived. So pretty. Welcome to the Christmas market! That's not what this sign says, but I don't know what it says... I really need to work on learning German. Manger scene in a glass case. There were little shops set up on the street selling all kinds of knick knacks and baked goods. Fox wanted some chocolate, so chocolate we got! It was dark chocolate. I prefer milk chocolate. That's one of the very few things I did not inherit from my dad - he LOVES dark chocolate! I'm like him in practically every other way though. Soaking it all in. The town hall is an advent calendar and will open up a window every day leading up to Christmas. Walking through the tunnel to the other half of the market. It was a short trip, perfect for our first one! As we were leaving the bells were ringing. We got some brats for dinner and then headed home! 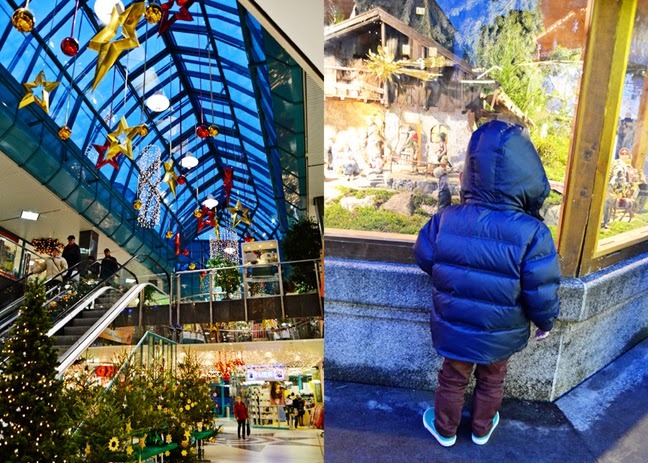 Pretty much every city has a Christmas market - that's a LOT of markets! We're hoping to go to the biggest and best one (supposedly) in Nuremberg this weekend! So beautiful!!!!!! I love Christmas!!!! Aw, so jealous we couldn't have been there during Christmas time! I definitely would have LOVED to see these in person! Yay Christmas!!!!!!! Always wanted to go to a German Christmas market! Beautiful! Wow!! So pretty and definitely gets you in the Christmas spirit! It's hard to feel Christmas-y around here, because our temps are going back up to almost 80 this week! UGH! Beautiful photos. wish I was there! Gorgeous Pictures, as always Paige! 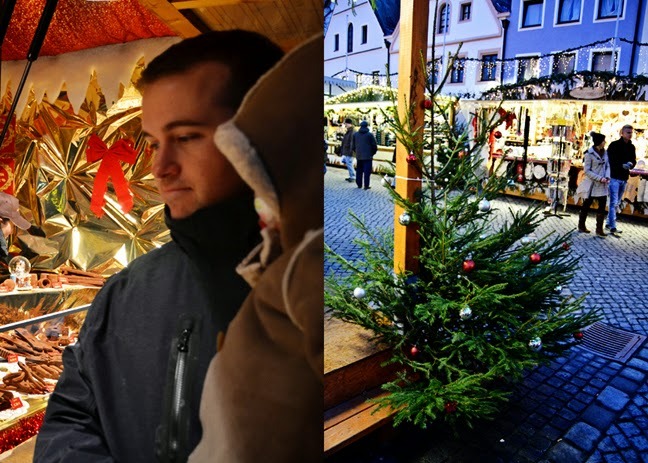 I can highly recommend the Christkindles market in Nuremberg as your next "destination"! Fun little outing! Sorry we couldn't go farther away because of my dumb DOD stuff. Love ya! The One with the Studio Calico Creative Team! The One with the 1700th Post Giveaway! The One with "What Does the Fox Say?"